After a hiatus due to our busy conference season, we have resurrected our office “Language of the Month” scheme. Today, Kasia, a Polish colleague of Sarah’s sister, was roped in to give us an hour of Polish over lunch. 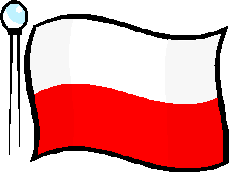 We were particularly interested in learning Polish as we shall be hearing a lot about it over the next few months what with the European football championships taking place in Poland and Ukraine in June, and EUROSLA being hosted by the Adam Mickiewicz University in Poznán in September. Kasia started the session teaching us common everyday phrases as “Dziekuje” (“Thank you”) and “Jak sie masz?” (“How are you?”) as well as numbers and some useful questions. Unsurprisingly, particular challenges for us were mastering sounds which we don’t have in English and trying to work out how things might be pronounced by looking at the spellings. We then were able to ask Kasia how we should pronounce our many Polish authors names correctly. We often find names such as Piotr Kuhiwczak and Adam Wojtaskez especially difficult to get right, so we are pleased to know how to say them properly now. I am very much looking forward to attending EUROSLA in Poznán and will be doing my best to attempt to speak a bit of Polish while I’m there. Kasia also gave us some helpful tips for visiting Poland, such as not waiting for people to form an orderly queue and not being surprised if we get a full health history when asking “How are you?”! 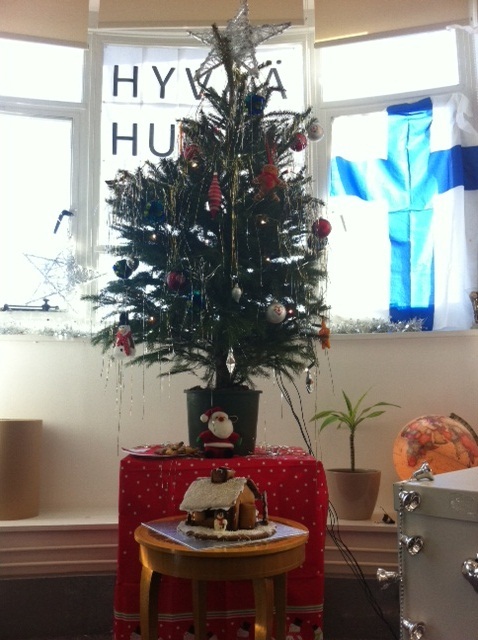 We spent a couple of hours last Friday afternoon giving our office a truly festive make-over. With Ellie still in New Zealand following the LED and TBLT conferences; Tommi away on a long weekend and Martisse at a Christmas party in Bath, Sarah and Laura were left to do all the hard (!) work. We put on our favourite Christmas CD, opened the Lebkuchen, emptied out the decoration boxes and set to it. Special features of our Christmas grotto/office include the return of the tinsel curtain (bigger and better than last year’s); Father Christmas lights in the window; stockings for each of us hung on the book shelves (an anagram of our initials is “lamest”!) and, new for 2011, a real Christmas tree! Here’s a photo, and you can click this link to see a 360° scrollable image: http://360.io/jPzPqa. Then yesterday we had a visit from Tommi’s parents, Mike and Marjukka. Marjukka had been very busy making us a special Finnish Christmas treat: a gingerbread house, or “piparkakkutalo” in Finnish. As we’ve been learning Finnish as our Language of the Month, we’ve been trying very hard to perfect our pronunciation of various words and, although we’ve now mastered “Teetä?” (“Would you like some tea?”) and “Kiitos” (“Thank you”), “piparkakkutalo” is beyond our current capability! We’re currently enjoying just looking at the beautiful piparkakkutalo, although I’m sure we won’t be able to resist tucking in before too long! We believe our office might be the glitziest office in the world, but to prove there are others who take decorating or baking as seriously as we do, we’d love to see a photo of what you’ve done to celebrate the festive season. In fact, we’ve decided to launch a competition: we’ll be giving away a free copy of one of our books (winner’s choice!) to our favourite photo. Please send them to info@channelviewpublications.com and our favourites might even get a mention on our blog. If you’re an avid follower of our blog you’ll know that each month we chose a “Language of the Month”. In anticipation of Ellie’s trip to the LED and TBLT conferences in New Zealand, November’s nominated language is Maori. We’d like to thank our author Vaughan Rapatahana who kindly provided us with a glossary of Maori and some useful links to get us started. Each of us took an aspect of Maori (and Kiwi) language and culture to present to the group…here’s a round-up of the most exciting things we learnt. I kicked the session off with a brief introduction to the language. 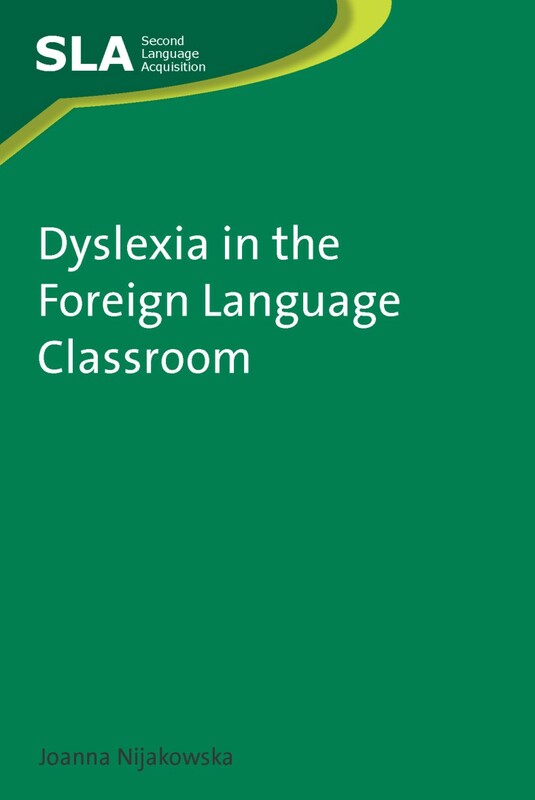 Having chosen the numbers as an easy starting point, we watched some videos to get the pronunciation right, including this one which we have all been singing ever since! We followed this up with a game of “number catch” and then bingo, which Martisse won, the speed of her call narrowly pipping Sarah to the post! I think I can say that we all now know our numbers and have been using them in the office ever since. Next, Ellie presented Maori food (Kai) to us all. She introduced us to hangi ovens, kumara (sweet potato) and rewena pararoa (Maori bread) as well as the great pavlova debate and the mystery of the term “Kiwi”. It was a great shame not to be able to toast our afternoon with a glass of Tohu wine, but we were all glad that Ellie didn’t bring in huhu grubs for us to try! Thanks to her friend “Ims” (aka Emma) for providing those! After that we displayed our catastrophic lack of knowledge during Tommi’s Maori sports quiz! Questions that we found particularly challenging included naming a Maori footballer who plays in the UK and remembering which Maori golfer won the US Open. Luckily we were all able to guess at least some of New Zealand’s 7 most popular sports, so no-one finished without a point! If you’d like to play along with us, answers to the three quiz questions mentioned are at the bottom. Sarah led the grand finale with her introduction to Maori culture. We heard about marae (the centre of Maori communities where cultural events are held) and the importance of music and chants to the Maori people. We then watched the New Zealand rugby team performing the haka at the World Cup and a clip of “Shortland Street”, a Kiwi hospital soap which is broadcast on UK daytime TV. Here are the answers of the quiz…how many did you get? !